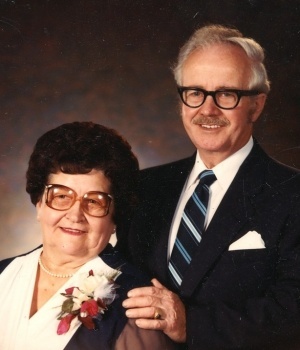 Abram Henry Wieler: preacher and educator; born 7 May 1920 in Orenburg, Russia to Heinrich Wieler (23 August 1895, Kamenka, Orenburg Mennonite Settlement, Russia – 30 March 1987, Swift Current, Saskatchewan, Canada) and Agnes (Wiebe) Wieler (20 July 1896, Petrovka, Orenburg Mennonite Settlement, Russia - 16 May 1983, Swift Current, Saskatchewan). He had six sisters and three brothers. He married Frieda Agnes Redekop (15 May 1920, Rosthern, Saskatchewan - 27 February 2013, British Columbia, Canada), daughter of Jacob F. Redekop and Agnes (Wiebe) Redekop, 22 August 1943, in Main Centre, Saskatchewan. They had three sons and one daughter: Dennis, Gerald, Stanley, and Karen. Abram died 11 October 1990 in North Delta, British Columbia. When Abe was a young boy the Wieler family left Russia and took up farming in McMahon, south of Swift Current, Saskatchewan, where Abe received his elementary and secondary education. Abe accepted Jesus as Saviour at age 15 and was baptized at age 18 and became a member of the Reinfeld Mennonite Brethren (MB) Church. After high school, Abe attended Herbert Bible School for three years, graduating in 1941. After completing high school in Swift Current and a teacher training year in Moose Jaw, Saskatchewan, Abe taught elementary school for two years in Moose Jaw. He was ordained to the ministry at Reinfeld, Saskatchewan in 1944 and served as a city missionary at the Swift Current City Mission in 1944-1945. Abe was then invited by his father-in-law, Jacob F. Redekop, to teach at the Mennonite Brethren Bible School (now Columbia Bible College) in Abbotsford, British Columbia. He taught there fourteen years, from 1945 until 1959, the last four as principal. In 1950 Wieler launched The Bible School Hour, a radio program broadcast from Bellingham, Washington and Chilliwack, BC. This continued until 1959. During the late 1950s he also led in establishing Columbia Bible Camp, now Stillwood. During the 1950s Abe served as board chairman for West Coast Children’s Mission and helped establish numerous churches. During this decade, in particular, he served in street ministries, tract distribution, and other evangelistic activity. Because of Bible School teachers’ low salaries, Abe spent long hours in cabinet-making and general carpentry. As his sons grew, they became his fellow builders. After further studies at Western Washington State College in Bellingham, Washington in 1959–1960, Abe served as pastor of Abbotsford Mennonite Brethren Church (now Central Heights Church). After two years in the pastorate, Abe accepted a call to teach at Bethany Bible School in Hepburn, Saskatchewan. He served there until 1968, the last years as principal. He thus completed twenty years as a Bible School teacher. In 1968 he returned to Abbotsford where the family had retained a home. During further graduate studies at the Vancouver School of Theology and by extension education, he completed two masters degrees in theology. He then served as pastor of the Queensboro MB Church near New Westminster, BC. He also assisted in other congregations. During the late 1970s and early 1980s Abe Wieler chose not to accept a full-time appointment but served in numerous part-time ministries while also working with two of his sons in carpentry and construction. For the last eight years of his life, 1982–1990, he was chaplain at the Pinegrove Care Home near the Fraserview MB Church in Richmond, BC. A gifted speaker, Abram Wieler began preaching at age 16; he preached for 54 years. He perpetually led Bible studies, for some time five each week. Throughout Abe’s long years of ministry, Frieda served faithfully, sacrificially, and effectively at Abe’s side. The Wielers’ hospitality, generosity, and willingness to help others touched many lives. On 16 October 1989, with Abe already battling cancer, the Wielers’ oldest son, Dennis, died, also of cancer. At that time Frieda asked God to give Abe at least one more year; it would be hard to lose two loved ones within one year. Abe Wieler was buried on 16 October 1990, exactly one year after his son’s death. In 1996, Frieda Wieler married Fred Brunner. Abram Wieler’s sermon notes and other personal papers have been donated to Columbia Bible College archives. Redekop, John H. "Wieler, Abram H. (1920-1990)." Global Anabaptist Mennonite Encyclopedia Online. October 2010. Web. 22 Apr 2019. http://gameo.org/index.php?title=Wieler,_Abram_H._(1920-1990)&oldid=142677. Redekop, John H. (October 2010). Wieler, Abram H. (1920-1990). Global Anabaptist Mennonite Encyclopedia Online. Retrieved 22 April 2019, from http://gameo.org/index.php?title=Wieler,_Abram_H._(1920-1990)&oldid=142677. This page was last modified on 8 January 2017, at 09:16.